To the outside observer, Matthew McConaughey’s career underwent a serious course correction seven years ago. It was 2011, and they called it the “McConaissance.” It was a much-vaunted, media-invented comeback narrative crafted around the actor, who had spent the 2000s seemingly adrift in a sea of light but successful romantic comedies, popcorn films that didn’t match the promise he had shown in his earlier years. But with a return to drama in hits such as The Lincoln Lawyer, Bernie and Killer Joe, McConaughey reclaimed his leading-man luster, culminating in the acclaim for his performances in Mud and The Paperboy. Even as the drums were beating about his haunting work as a fire-eyed, driven lawmaker in the HBO series “True Detective,” he was winning an Oscar, the ultimate comeback accessory, for his unforgettable starring performance in 2013’s Dallas Buyers Club. That’s from the outside, looking in. McConaughey is sitting on a makeshift stage in the outdoor beer garden of Contigo, an Austin, Texas, restaurant, on a sunny April afternoon. He sports a three-day beard and the tanned look of someone who spends a lot of time outdoors with his kids. For McConaughey, that comeback story feels like a stretch. If you ask him, he’ll tell you he never went away. As he talks, McConaughey is waiting to speak at an event before a group of Texas liquor distributors, to help launch Wild Turkey Longbranch, a new blend of Bourbon the actor helped to create. 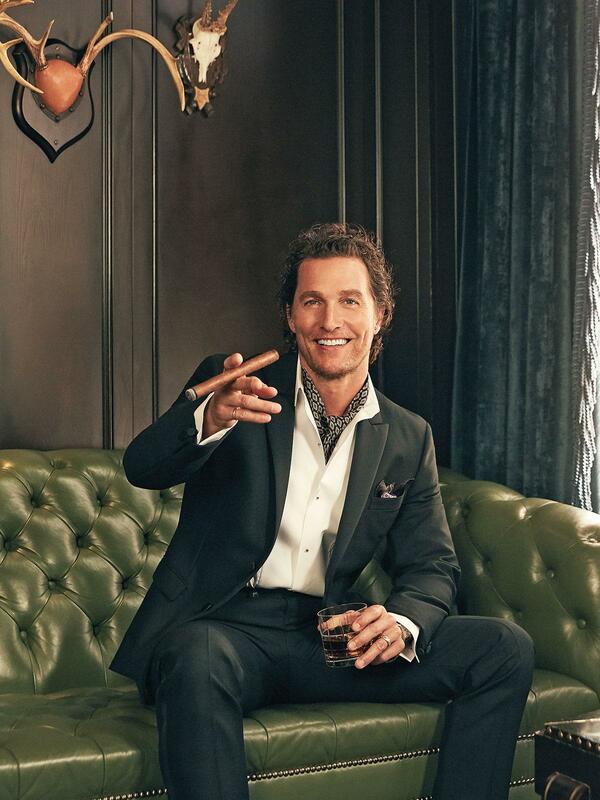 More than just a celebrity spokesman, McConaughey is the creative director for Wild Turkey, a position he’s held since 2016. Initially approached by the brand to be its famous face, McConaughey countered with his vision of how to introduce the label to a generation of millennials who were just discovering the possibilities of Bourbon. He wrote and directed a pair of short films for the brand, and collaborated with master distiller Eddie Russell in a two-year process to create Longbranch, which hit the American market in May. McConaughey hasn’t had much time for sitting on the back porch of late. Along with launching the new brand, McConaughey shot three films in the past year, all of which will come out later in 2018: White Boy Rick, a drama based on a true story; Serenity, a thriller opposite Anne Hathaway; and the raucous comedy, The Beach Bum. McConaughey finds himself most drawn to roles that “give me butterflies, that scare me right away.” Since winning his Oscar, he has taken on roles in films with blockbuster budgets (The Dark Tower, Interstellar), but has shied away from the kind of glossy star vehicles that dominated his resume in the first decade of this century. That’s to take nothing away from the success of films like How to Lose a Guy in 10 Days. “I still get residual checks from that movie,” says comedian Robert Klein, who played McConaughey’s boss in the 2003 film. In going back to his independent roots on films such as Mud and Dallas Buyers Club, McConaughey reconnected with the energy and excitement that drew him to the process of making movies in the first place. McConaughey won the Oscar playing an unlikely—but real-life—HIV activist. When Texan Ron Woodroof is diagnosed with HIV in the mid-1980s, he creates a network to smuggle in treatments used outside of the United States. He sues the FDA and ultimately gets legal access to the drugs that would stretch his life expectancy by seven years. A veteran of more than two decades in Hollywood, McConaughey navigated the sometimes tricky currents of Oscar campaign season, he says, because the movie and performance spoke for themselves. “I watched the finished film and thought, ‘I’d shake hands with that,’ ” he says. “When I watch myself onscreen, if I see myself too much, I think, ‘What’s McConaughey doing up there?’ But with this one, after the first scene, I was with Ron Woodroof. I thought the performance was true. That was certainly the case with “True Detective,” the critically acclaimed HBO series. McConaughey costarred with Woody Harrelson in the 2014 debut season (the second season, which aired in 2015, featured an entirely different cast and storyline) and both nabbed Emmy nominations for best actor in a drama series. The moody, unnerving tale of a murder investigation in rural Louisiana hit McConaughey as hard as it did the rest of the viewing public. The list of high-profile directors he’s worked with is impressive, from Steven Spielberg (Amistad), to Ron Howard (edTV), Steven Soderbergh (Magic Mike) and Christopher Nolan (Interstellar.) He even worked with Martin Scorsese on The Wolf of Wall Street, in a brief but memorable appearance as a chanting, chest-thumping, coke sniffing boss who sits down to lunch and asks his waiter to bring him and his new hire Leonardo DiCaprio rounds of dry Martinis until one of them passes out. 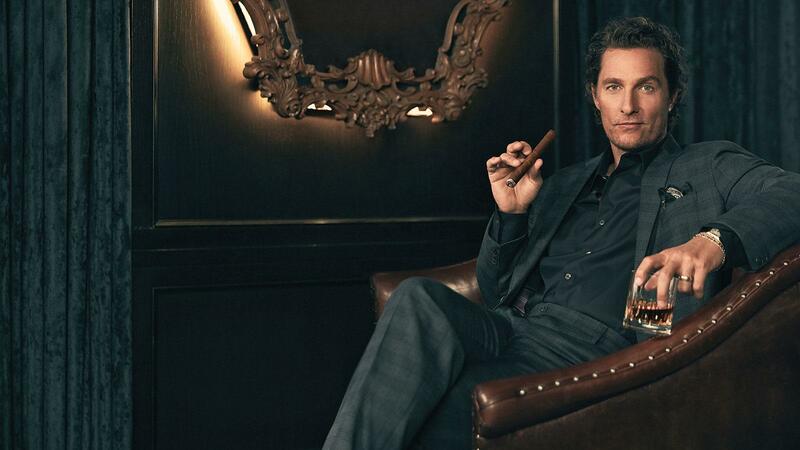 These days, McConaughey tends to enjoy most of his cigars while he’s on the golf course. He likes a medium-sized Romeo y Julieta, but found himself smoking larger, maduro-wrapped cigars for the upcoming The Beach Bum, mirroring the film’s director, Harmony Korine. Part of that effort includes moving his family to Austin, the Texas state capital and home to his alma mater, the University of Texas, about 160 miles from his hometown of Uvalde. With its thriving economy, burgeoning tech sector and Sun Belt climate, Austin is the 11th-largest city in America and one of the fastest-growing, with both strivers and retirees causing the population to mushroom. To McConaughey, the big city still has the soul of a village. The tricky part, he says, will be for it to maintain that sensibility even through current and future growing pains. When McConaughey last graced Cigar Aficionado’s cover, he and Alves had two children but had yet to tie the knot. At that point, McConaughey said, “Marriage—it’s not something we feel we need to be complete. It doesn’t mean we won’t do it.” The pair married in June 2012. So what changed? Fatherhood has been a discovery. Kids “are who they are, right from the start,” he says. “You can shepherd them, nudge them into position to be themselves. But each month they’re more who they are than ever.” His children have yet to see his face onscreen, for they’ve only been allowed to see two of their dad’s movies, the animated films for which he provided character voices: 2016’s Kubo and the Two Strings and Sing. The rest of the filmography will have to wait. Back at the Bourbon event in Austin, McConaughey is walking around, mingling comfortably with several dozen liquor distributors. He and Eddie Russell have concluded a presentation explaining the origin of Wild Turkey Longbranch. The pair chatted about the process of refining the blend, how they hit on the idea of adding mesquite charcoal to give a Texas twang to the distinctive Kentucky whiskey, and what particular time it was when McConaughey called Russell with great enthusiasm, to wake him up after tasting what became the ultimate blend. Russell also notes that the actor had considerable influence on the blend’s bottle design. The discrete label takes up less than a third of the Longbranch bottle’s distinctive geometric front and features both McConaughey’s and Russell’s signatures, above raised-glass lettering. After the presentation, McConaughey works the crowd, just another Texan with an appreciation for strong brown liquor, although one with whom everyone in attendance wants their picture taken. “I dealt with him quite a lot during the process and it was a fun ride for me,” Russell says. “I was surprised at how down-to-earth he is. You think about how a big movie star will be but he was just a big family man. And that’s what it’s about for us at Wild Turkey. McConaughey’s distinctive voice and phrasing made his ads for Lincoln automobiles stand out, as they do with the films he’s created for Wild Turkey. And he recently added another brand to the lineup. “I just signed an endorsement deal with Carl’s Jr. because I love beef,” he says with a smile. “So I’ve got Carl’s Jr., Lincoln and Wild Turkey Longbranch: beef, Bourbon and cars,” he says, referring to the long American heritage that unites the three products. “They’re three things I really like,” he says. That comfort includes a sense of self-awareness—as well as a distinct ability to articulate his introspection into his own motivation and drive. “I work everyday to do my best to know who the heck I am,” he says. “I’m not going to walk out the door and try to be anybody else. I’m not one of those guys where you’re going to uncover some Pandora’s box of who I really was. That’s what ‘just keep livin’ means. I’ve got the right to be me and, as a citizen of the world, to live my life. That was inherent to me long before I was famous. I’m still living my life and am going to be myself. I owe that to myself—and to my family and my father and my lineage.